So you think you have got what it takes to embark on a career in medicine. To take a giant leap into the relative unknown, in the hope of coming out as a Doctor. Well the road to becoming a Doctor is not always smooth and there are several waypoints that you must pass along the way. So for the curious mind I'll be covering some things to consider before embarking on such a journey. Over the next couple of weeks I'll be covering topics from the macro level such as Australian medical schools and places, right down to specific details concerning the Graduate Australian Medical School Admissions Test (GAMSAT). Disclaimer: Information posted here was accurate at the time of writing, please always check official resources to access current information. To practice as a Doctor you most commonly are required to obtain a Bachelor degree in Medicine and Surgery otherwise known as the MBBS. There are several other types of programs that also allow you to practice as a Doctor, with the Doctor of Medicine or MD at the University of Melbourne being the latest addition in Australia. Australian medical schools emphasise clinical experience throughout the course of their programs through initiatives such as Problem Based Learning (PBL). In addition, medical education at university level is more about creating generalist doctors upon graduation, rather than early specialisation. There are two main pathways into medicine; undergraduate and graduate. Some will choose to do an undergraduate degree first while others will go straight into a medical program after high school. Depending on which pathway you choose your medical education will vary slightly. For those fond of imagery, this is a simplified overview for getting into a medical program.Click on the image to see a larger view. UMAT the younger sibling of the GAMSAT, is a test devised by ACER used to select students for entrance into medicine, dentistry and other health science degree programs. The undergraduate route typically takes 6 years with a progression from more theoretically learning at university to clinical sessions in hospitals. Graduate entrants are relatively common for Australian medical programs. Graduate programs are on average four years long with variations in course structures between schools. 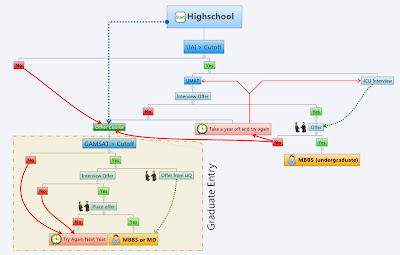 The admissions process for graduates can be quite lengthy. From GAMSAT registration near the end of the year through to interviews and late round offers in November and December the following year. A point of clarification, while these programs use graduate-entry as one of the requirements, the MBBS program is actually an undergraduate degree. This has particular relevance for domestic students who are on government assistance schemes such as Youth Allowance. The term 'Mature age' can mean different things depending on the context. In this context, I'm referring to individuals most likely over the age of 35 who for a number of reasons have decided to jump into the world of medicine a little later in life. Your selection will be similar to the Graduates, as this would be your most likely method of entry. An important thing to consider is that the completion of your last degree has to be within the last 10 years on the year of application. If this is not the case, most people choose to do a one years Masters or something similar to reach that requirement. Secondly, consider that semi-formal Medical education continues after medical school, and it will take a number of years before you become a consultant (e.g. fully qualified specialist or GP). or that you won't be able to bring anything to the table or keep up with the work. If there is anything I've learnt from my first couple of weeks of medical school, it's that everyone has skills and knowledge that can add holistic value to everyone's medical education. Last, but not least, our finally major group of contenders are the international students. There are places available for international students in both undergraduate and graduate programs, however admissions processes can vary slightly between medical schools. International students may not be required to take the UMAT for undergraduate programs depending on the school. Instead you maybe required to sit the ISAT. Most graduate medical programs accept either MCAT or GAMSAT scores but you should check with programs before applying. the possibility of not getting an internship in Australia at the completion of your degree (please note: various parties are currently trying to sort out this problem and it may be solved, but it is still a noteworthy risk). As a general indicator, annual university fees can range between $40,000 and $50,000. It's best to check the medical school you're applying to for exact details concerning admissions and fees. Finally, you have to consider that if your are returning to your native country or wishing to practice abroad, you may be required to pass a local medical licensing exam (e.g. USMLE). Stay tuned for next week when I take a look at Where to Study…..